Hastings (pop. 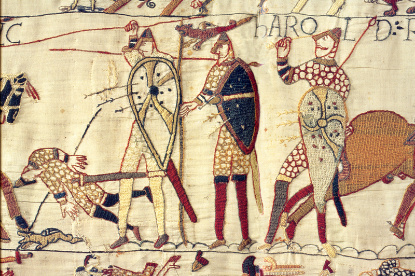 84,000) is known by anyone of has studied the history of England as the place where William, Duke of Normandy, landed in 1066, defeated his cousin King Harold in the battle of the same name and became the first king of England of the dynasty that continues to this day. The celebrated Battle of Hastings did not however take place in Hastings itself, but in a nearby field, which is now the village of Battle. From the 12th to the 15th century, Hastings was one of the Cinque Ports ("five ports" in French), along with New Romney, Hythe, Dover, and Sandwich, that enjoyed special privileges, such as the right to import goods free of duties. Hastings is now known as a a seaside resort and education centre (Hastings College and University College Hastings). Little remains of William the Conqueror's Castle, but the ruins can still be visited as part of the 1066 Experience, an audiovisual that retraces the events of the year of Hastings' landmark battle. 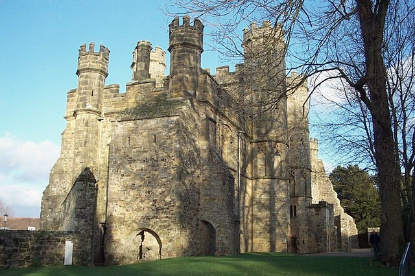 Two other family attractions have combined tickets with the castle : the Smugglers Adventure Park and the Blue Reef Aquarium. The town itself has various historical buildings, such as the 15th century timber houses on All Saints Street. The only survivors from medieval times are All Saints and St Clement's churches. Pelham Crescent in front of the castle, is Georgian terrace, with the classical church of St Mary at its centre. Like many other towns on the coast of South England, Hastings has its own white sandstone cliff, the West Hill, with a lift (£1) of its own. 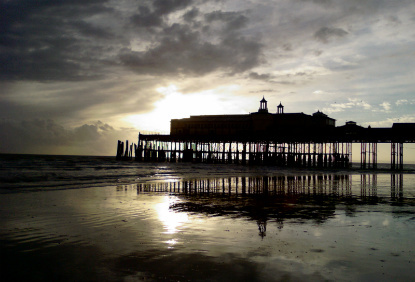 Other attractions include the Hastings Museum & Art Gallery, Fisherman's Museum , and Shipwreck Heritage Centre. 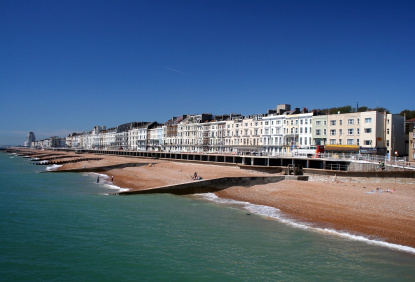 Hastings is about 90km south of Central London to which it is connected via the A21 motorway, passing through (or near) Bodiam Castle, Tunbridge Wells and Sevenoaks (Knole House). Trains connect Hasting to London's Charring Cross station (1h15min, £26.30), Brighton (£12.40, 1h15min) and Portsmouth (£20.70, 2h30min). National Express has limited bus services to London (2h50min to 4h, £11) and Tunbridge Wells (1h, £4.30), but no connection to either Brighton or Dover. Local bus No 711 links Hastings to Brighton and Dover.